Grief enters our hearts in many ways. If we are to heal, we should become familiar with these multiple access points, each of which leads to the communal hall of grief. The First Gate: Everything We Love, We Will Lose – This is life’s most difficult but essential teaching: everything is a gift but nothing lasts. To accept this fact is to live on life’s terms and not try to deny the simple truth of loss. Everything that we love, we will lose; no exceptions. Grief says that I dared to love, that someone has touched my life. The Second Gate: The Places That Have Not Known Love – These are the parts of us that we have wrapped in shame and banished to the farthest shores of our lives. Because we hold them in contempt and refuse to allow them the light of day, we also deny them the healing salve of community. What we perceive as defective about ourselves, we also experience as loss. But we cannot grieve for something that we define as outside the circle of worth. We are chronically sensing the presence of sorrow but are unable to truly grieve because we feel in our body that this piece of who we are is unworthy of grief. Grieving, by its very nature, confirms worth. I am worth crying over: My losses matter. The Third Gate: The Sorrows of the World – Whether we consciously recognize it or not, our psyches note the daily diminishment of species, habitats and cultures. Much of the grief we carry is not personal, but communal. It is not possible to walk down the street and not feel the collective sorrows of homelessness or the sorrows of economic insanity. It takes enormous energy to deny the sorrows of the world. Walking through this door brings us into the room of the great grief of the world. The Fourth Gate: What We Expected and Did Not Receive – This entry into sorrow calls forward the things that we may never even realize we have lost. Long centuries of intimate, communal living have programmed our indigenous souls to anticipate being welcomed in the world, to experience what our ancestors knew as their birthright – the container of the village. We are born expecting a rich and sensuous relationship with the earth and communal rituals that keep us in connection with the sacred. Their absence in our lives haunts us, even if we can’t give them a name, and we feel their loss as an ache, a vague sadness. I feel perpetually in exile because I was never welcomed into the world. The Fifth Gate: Ancestral Grief – This is old grief we carry in our bodies from sorrows experienced by our ancestors. It also carries the weight of our abuses of the indigenous cultures on this land. This grief is so immense it is hard to reconcile. The long shadow of this violence persists in our psyches. And – whether we know it or not – we also grieve the loss of the ancestors. We no longer look to them as a source of connection with the invisible powers in the world. This loss of our connection to the land, language, imagination, rituals, songs, and stories of our ancestors has made us all homeless. Again, I am in exile because of something I cannot even name. Ultimately, these five gates all lead to the same chamber, the communal hall of sorrows. It makes no difference which door we open, which threshold we cross. Every one of us has grief at each of these gates. When we feel hesitant or uncertain of our worthiness to touch our sorrow, knowing that these gates are there offers us a way to connect with our losses, wounds, and disappointments. The Sixth Gate: Regret and Remorse: These are the things I said and the actions I did that hurt others, as well as the things I failed to do or say that might have brought more healing. This is a vast area that would certainly include those many moments when I failed to give my gifts – my original medicine – to the world. It would also include the wounds we have experienced – that others have done to us – but which we never had the opportunity to grieve. The traumas of ungrieved violence arise here in our troubled hearts, and they are not limited to what happened to us. Countless veterans, for example, suffer from the memory of horrendous conditions they experienced and the friends they lost. But for many much of their ongoing trauma also stems from the violence that they were forced to perpetrate. Indeed, some have speculated that a major factor in PTSD is not the memory of fear and terror but the knowledge that one has killed others. I wish I hadn’t done that. We could go on for quite a while about this gate, but I’d like to focus on one specific regret, because recently I’ve been feeling it deeply. In the past three years I’ve lost six friends. I have already written about one of them. The second didn’t live nearby, so I guess I had an excuse (see below). The third lived right around the corner, so I had no such excuse. Here is the essence of this gate for me: in each case, I feel a grief for not getting to know her better. I really regret that, regardless of all the perfectly good reasons, I didn’t go further out of my way and make enough time to be in her presence more. It’s easy to speak of this regret. All six of these people, after all, were truly exceptional people. All were authors, teachers and/or public figures. I could have learned so much. The community is lessened when the tragic circumstances of life prevent us from feeding that food to the world. And we as individuals have to carry the (often unacknowledged) grief that we were not hungry enough to welcome those gifts; we didn’t sit long enough or often enough at the table of each person’s uniqueness to fill our stomachs. Perhaps the loss – and the regret – goes even deeper. No matter how much we have known someone, no matter how much we have loved them, haven’t we lost some potential benefit by not knowing them even better? And of course to know more about them would have meant two things: to be able to listen, and to show more of ourselves. 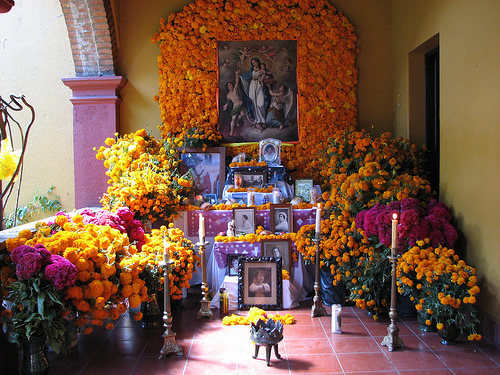 Please join us on Saturday, November 3rd in El Cerrito for our annual Day of the Dead Grief Ritual, when we can all enter the communal hall of grief through this or any of the other portals, when we can drop some of the weight of unacknowledged grief we all carry, and when the community can welcome us back.